Whether you're presenting a budget, analyzing inventory, or projecting sales figures, it can be difficult to effectively present your data. How do you convey your message using just numbers in reports? Can you tell a story and guide your listener trough the multiple data points? We can help! The new presentation mode in the Power BI app is specifically designed for the Surface Hub and other big touch screens, so you can bring data presentation to the next level. The new full screen view for reports clears all the background noise and focuses your audience's attention on the numbers. Once you enter this mode on your report, we'll hide all navigation and menu bars from the screen. You can still navigate between the report pages using the new and minimized menu. A good data presentation takes the audience on a journey, explaining the different metrics both verbally and visually. With the Surface Hub’s stylus, you can annotate on top of your report data in order to emphasize, explain, and highlight different parts of your reports. To make this an intuitive and easy experience we added a set of useful functions into an action bar that's available on both sides of the screen. With this new action bar you can configure the ink color, or clear all of the inking on the page. More actions like refreshing the report data and navigating between the report pages (sequentially or hop to a specific page) are also available. KING 5 News, a multi-platform media company and NBC affiliate based in Seattle, uses Power BI to tell the story of elections, tailored to a TV broadcast. 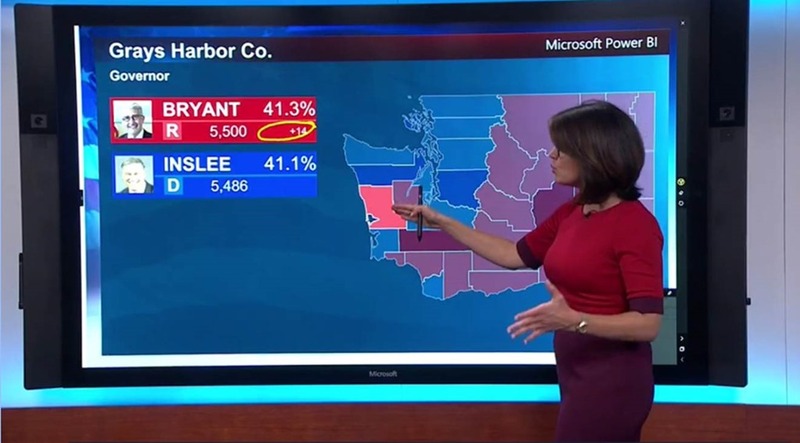 The new presentation mode in the Power BI app recently debuted in the KING 5 News coverage of the recent state election in Washington. Surface Hub presentation mode is enabled by default in Power BI for Surface Hub, and it can be enabled on laptops and tablets via the app settings. 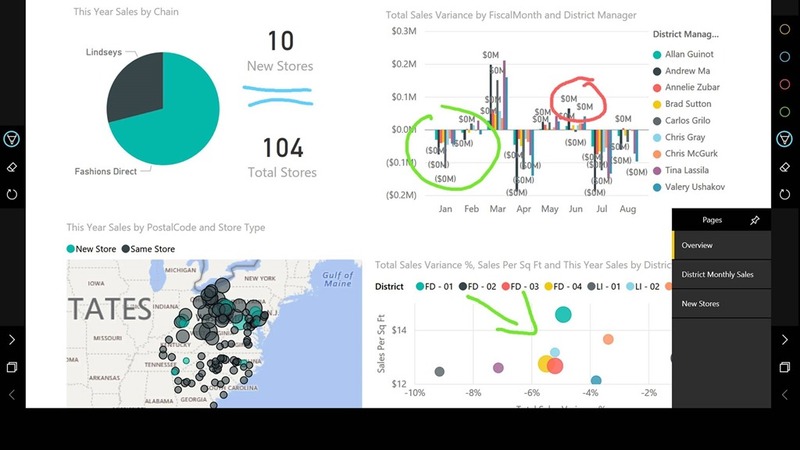 If you are using Power BI to tell the story of your data, either in an executive meeting, to customers, or even in a small team meeting, give it a try and provide your audience with a sleek and unforgettable presentation experience! Learn more about Power BI Mobile app presentation mode for Surface Hub. Подпишитесь на рассылку, чтобы получать новости о Power BI по электронной почте! Нажимая кнопку "Зарегистрируйтесь сегодня", вы даете свое согласие на получение новостей, исследований, советов, рекомендаций и другой информации, предоставляемой корпорацией Майкрософт в рамках информационных бюллетеней Power BI, чтобы максимально эффективно использовать Power BI. Вы можете в любое время отказаться от рассылки. Заявление о конфиденциальности Майкрософт.